« Desert Dolls host screening of This is Roller Derby! Desert Dolls Roller Derby is putting on a charity bout with two mixed teams featuring skaters from all 4 home teams (Pretty H8 Machines, Cosmic Killas, Shotgun Shirleys, & Joon Cleavers) to raise money for Devereux Arizona. 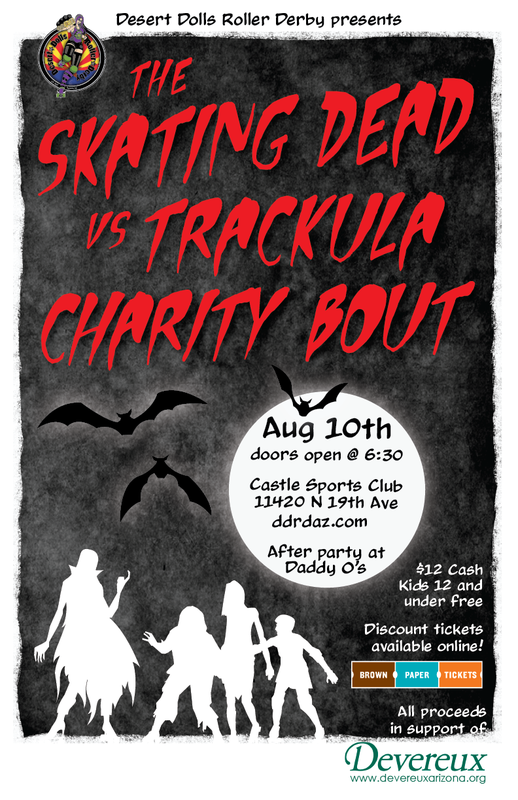 The theme of this event is the Skating Dead vs Trackula. We encourage fans to dress up as Zombies (Skating Dead) & Vampires (Trackula) for a chance to win great prizes at half time! Donate $50 or more for a chance to win season tickets for our upcoming 2013/2014 season. Tickets will cost $12 at the door the day of, buy earlier to save a few bucks. Doors to the event open at 6:30PM, but we suggest you be there earlier to get good seats.